This was to be my last day of fishing in Wales, this time back on the Irfon, and with packing in mind I decided that I should venture out early instead of late. I hadn’t been on the water at crack of dawn at any point. Mostly because dawn is so early there would be little point in going to bed. The directions were clear, and a wondrous discovery during my trip, the cell phone GPS /Sat Nav will find a building based on nothing more than the post code. You just put in EX23 8DG and it will take you to the door of my old childhood home for example. This beat had such a post code reference and it was a piece of cake to locate it. The estate is large and on it there is a church right down by the river, there are a variety of access points but with such an early start I didn’t wish to risk causing disturbance to anyone else and this parking spot and access point was far from the main house. I parked right in front of the Church, (I was to find out later that the building only has gas lighting and no electricity and that during the summer months there is a service on the last Sunday of each month). A tiny church within the estate, not yards from the Irfon River. It did strike me that attractive as the place was, it would have proven of little use in converting me. Being forced to listen to a sermon on the inside whilst trying to see fish in the river I fear would have seen me excommunicated at best. 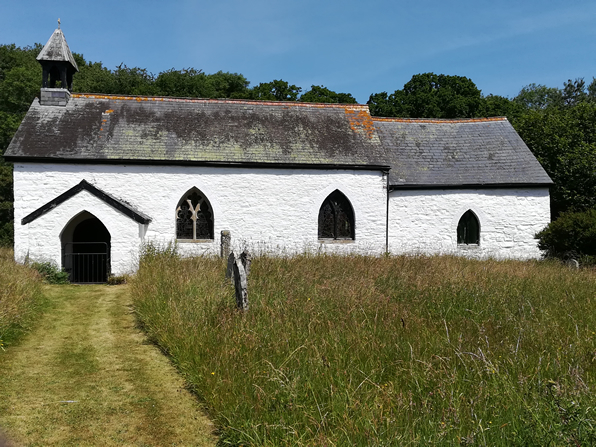 There is also another tale associated with this church, which I have been unable to substantiate, that Prince Llewellyn the Last prayed here before being tricked and killed by the English the next day. I am not going to venture what that may say about the powers of prayer or the possible affiliations of God with the English. If God isn’t a Celt I’m not interested. However, all of that aside, I headed down to look over the beat, the river steaming like a sauna because the water was far warmer than the air. The sun was toying with the idea of coming over the hill and heating things up. However I was a little disappointed that the first sections of the river looked very slow moving and not ideal for trout and grayling fishing. Although lower downstream than the section I fished on the Colonel’s Water, I was expecting the flows to be limited as they were higher up. I had however learned that these rivers change character throughout and wandered through the woodlands, working my way upstream and seeking out suitable fly water. I took a few small fish from a gravel run, shallow enough to force the current to speed up slightly and then took a couple better fish where the rock bed forced the current to accelerate once more. Gradually as I headed upstream the river changed character and looked far more inviting to fish. The River narrowed from there on, with more overhanging trees but at the same time more moving water and I was now catching both fish and branches with some regularity. Switch casts and roll casts became my primary weapon and I took some nice fish. Focusing mostly on getting drifts under the many trees which overhung the water. 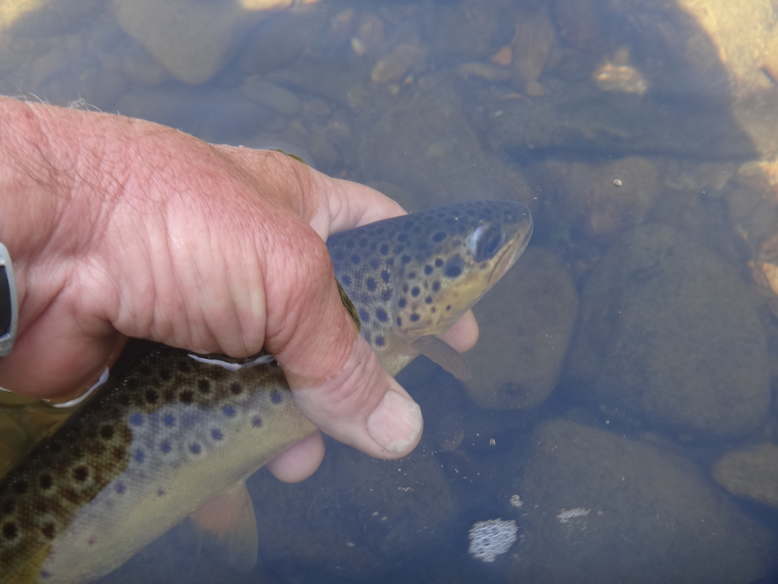 I took a number of very pretty brown trout, not huge but beautifully marked and strong for their size. At this point, whilst lining up a possible flick under the dark shade of the vegetation I became aware of a family of otters playing in the shadows. Unfortunately we pretty much saw each other at the same time and then playtime was over and they disappeared. Lovely to see though, I would say at least three and perhaps more, but their departure was as though a puff of smoke vanished. Not a ripple on the water or a communicative squeak. They were there and then they were gone. The final fish of the day a grayling on a long cast into the head of a large but shallow run, my only “lady of the stream” and I was well pleased. All in all I think that I had captured 15 odd trout and that solitary grayling in a four hour session. 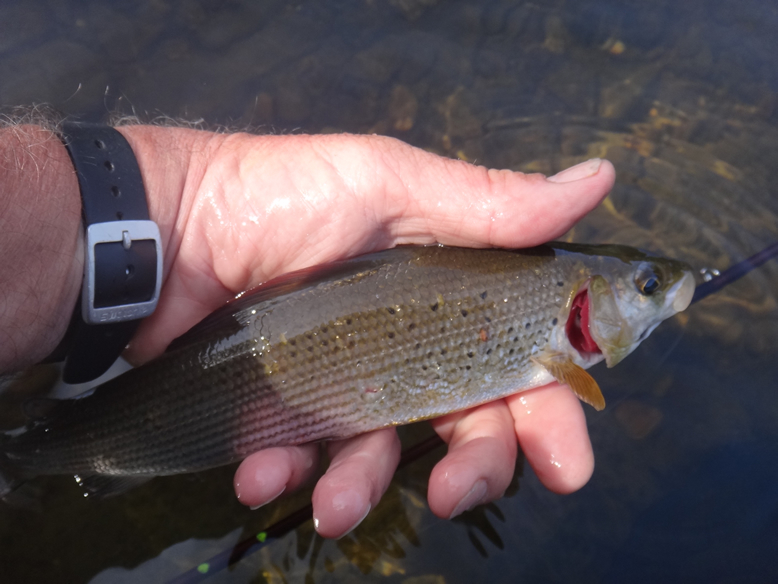 I was well pleased to catch a grayling at the end of the session. A long slack line cast and a take to the dry. I think the only grayling I had come to the dry fly during the trip. On my return to the car there were, unexpectedly, people exiting the church and I was able to speak with the estate owner. He seemed surprised that I had caught fish, apparently a recent previous visitor had lashed the water without so much as a take. Driving off the estate I came across a team of shearers with a portable outside shearing station, I didn’t take any pictures, fascinated as I was, I felt that I might have been in some way intruding. But I asked Jane when I got back to the cottages. “How do they keep the sheep still” and she suggested that in these high temperatures the sheep were probably only too glad to get rid of their coats. I was thinking that they might not be quite so pleased tomorrow morning if the temperatures are a repeat of the past 24 hours. I had planned my day well, being a Sunday I was going to finish fishing, clean up and then head out to the Red Lion for a plate of authentic Welsh cuisine as a final goodbye to the land of Cymru . Alas arrival at the Red Lion coincided precisely with the closure of the kitchen until 6.00pm and having not eaten since the previous morning’s breakfast I couldn’t wait. (I had skipped breakfast so as to attempt hypothermia during an early dawn session on the river). I went to another pub / restaurant… no they closed at 2.00 on a Sunday and didn’t reopen until Monday. I then found a place that boasted serving food until 3.00pm on a Sunday, the rub was that by now it 3.00pm – kitchen closed. In the end my dreams of real ale washing down a plate of traditional Welsh fare were squashed and I had to settle, (hypoglycaemia was imminent) for a visit to Burger King, the only place I could find open. Dreams of a hearty traditional Welsh supper were quashed and I had to settle for the most disgusting burger I have ever had the misfortune to consume. 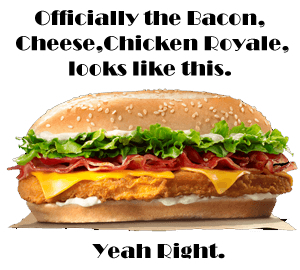 I ordered a “Bacon, Cheese, Chicken Royale” (my italics) . I think that they perhaps have trained the chickens to be grown in tins in the same manner that some places manage to grow fruit in glass jars. “Tasteless” would be to grossly over emphasize the effect on one’s palate, no matter that starvation was near set in. The bacon I never actually located and the cheese was some sort of melted goop that one expects to find in junior school science experiments. My mother always said that “Hunger makes the best sauce” in which case the sauce wasn’t up to scratch either, I was absolutely famished and could still barely force myself to swallow. Thoroughly disappointed with what was supposed to be my final meal in Wales I opted to change the schedule slightly so that I could at least enjoy another of Richard’s magnificent breakfasts at Pwllgwilym cottages. Not the full Monty you understand, but at least raspberries with Greek yoghurt and cereal, followed by poached eggs on toast. I couldn’t let my final culinary experience in the land of the red dragon be a burger that tasted like foam rubber. So it was that, packed and ready for departure to parts new, I enjoyed one last breakfast before hitting the road. I was genuinely sorry to leave, it was like living at home but for the fact that home is actually probably not that comfortable. 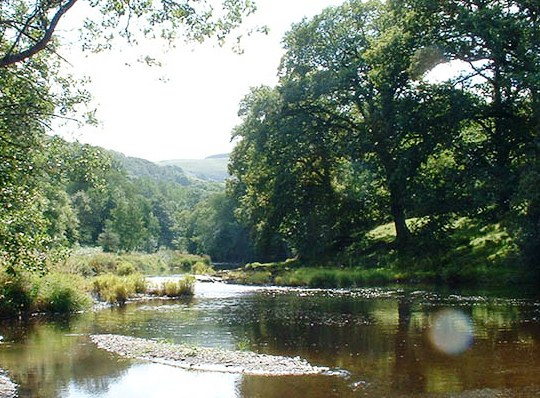 Should you ever visit Mid Wales, fishing or not, I would highly commend Pwllgwilym: Bed and Breakfast and Cottages. Richard and Jane are wonderful , relaxed, welcoming and efficient hosts. Richard also runs standard and bespoke tours of Mid Wales and is a mine of information on the locale. Without a doubt the nicest, neatest, friendliest place I have stayed during my travels here. They have a 9.9 out of 10 rating on bookings.com and they deserve it..